Peshmerga troops en route to Kobane to reinforce the Syrian Kurdish fighters battling Islamist militants were welcomed by large crowds while traveling through the southeastern Turkish province of Mardin. Turkish Kurds cheered as a Peshmerga convoy was crossing the border district of Nusaybin, waving Kurdish flags and flashing victory signs. 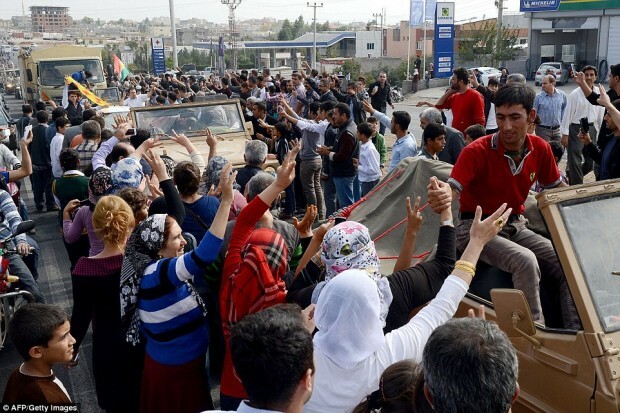 The district head of the Peoples’ Democratic Party (HDP), Şehabettin Güler, stepped onto one of the vehicles in the convoy and saluted the crowd. More than 150 Kurdish fighters, which traveled in two groups, by air and land, crossed into Turkey in the early hours of Oct. 29, preparing to reinforce the Kurdish forces in Kobane, which has become a crucial battleground in the fight against the Islamic State of Iraq and the Levant (ISIL). Lots more photos at The Daily Mail. The Kurdistan Workers’ Party, commonly referred to by its Kurdish acronym, PKK, is a Kurdish militant organization which from 1984 to 2013 fought an armed struggle against the Turkish state for cultural and political rights and self-determination for the Kurds in Turkey, who comprise between 10% and 25% of the population and have been subjected to official repression for decades. The group was founded in 1978 in the village of Fis (near Lice) by a group of radical Kurdish students led by Abdullah Öcalan. The PKK’s ideology was originally a fusion of revolutionary socialism and Kurdish nationalism, seeking the foundation of an independent, Marxist–Leninist state in the region known as Kurdistan. The democratic confederalism of Kurdistan is not a State system, it is the democratic system of a people without a State… It takes its power from the people and adopts to reach self sufficiency in every field including economy. In 2013, the PKK accepted a ceasefire agreement and began slowly withdrawing its fighters to the Kurdistan Region of northern Iraq as part of the so-called “solution process” between the Turkish state and the long-disenfranchised Kurdish minority. The Syrian Kurds are closer to the Turkish Kurds politically than the Iraqi ones so Turkey does not particularly trust them either. The Kurds are largest group in the world without their own state.